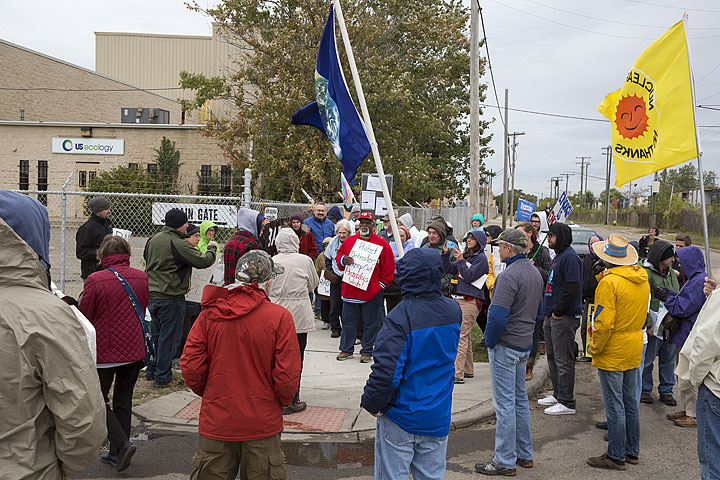 Committee to Ban Fracking in Michigan volunteers, Ban Michigan Fracking, Metro Detroiters for Bernie, and residents in the nearby community from Hamtramck and Detroit around the Detroit US Ecology hazardous waste facility gathered for a protest October 3. Photo: Jim West. 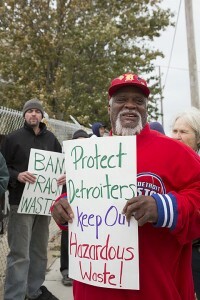 Forty-five activists and community members gathered on October 3, 2015 at the US Ecology hazardous waste facility in Detroit to protest expansion of the facility. They included nearby residents from Detroit and Hamtramck, retirees, nurses, professors, lawyers, students, engineers, photographers, teachers, former and current city workers, a Detroit school board member, and retired postal workers. 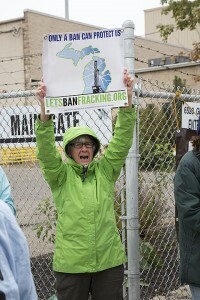 In addition to Ban Michigan Fracking, the groups Beyond Nuclear, Don’t Waste Michigan, Metro Detroiters for Bernie, Carrie Rogge Block Club, Great Lakes Water Protection Committee, Detroit Workers Voice, and Michigan Citizens for Water Conservation, joined members of a local mosque and volunteers of Committee to Ban Fracking in Michigan from around the state. The Detroit facility, which processes frack wastes, has applied to the Michigan Department of Environmental Quality to expand its operations tenfold. Ban Michigan Fracking has reported on the amount of frack waste coming to Detroit from Pennsylvania for many months (*see below). The Detroit Free Press reported on the expansion on September 11, and the DEQ’s public comment deadline the next day, Saturday, September 12. BMF wrote public comments to the DEQ, demanding an extension of the public comment period, demanding that DEQ deny the permit, and discussing the harms of radioactive frack wastes and TENORM. Nearby residents concerned about the frack waste expansion and harm to families. Photo by LuAnne Kozma. The DEQ granted the extension of the public comment period to October 12, but no public hearing has been planned. BMF encourages people to write DEQ and demand a public hearing. 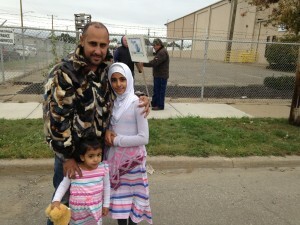 The nearby community and all Michigan residents deserve to be heard. 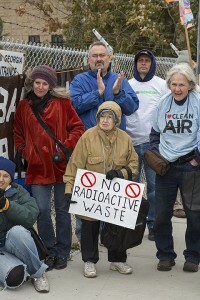 Write comments to: Richard Conforti, MDEQ, at confortir@michigan.gov or by mail c/o DEQ, P.O. Box 30241, Lansing, Michigan, 48909-7741. This was startling news, and what BMF had speculated for some time. The company’s admission was proof that wastewater from processing hazardous wastes at the site — 40% of which comes from out of state — goes directly into the public water and sewerage system. Why else bring out-of-state frack wastes for processing to Detroit? When liquid wastes that are too hot radioactively to be disposed of here — DEQ’s Ken Yale has told BMF that wastes are solidified in Detroit first and then shipped for disposal at US Ecology facilities in Idaho — are brought here on their way west, there’s got to be a practical reason. Why wouldn’t Pennsylvania’s frack wastes be sent directly from Pennsylvania to Idaho? Other groups, such as the American Human Rights Coalition, based in Dearborn, are also opposed to the expansion. AHRC is raising community awareness and demanding answers to what impact the expansion would have on the Detroit water system. Which could pose a problem for facilities like US Ecology. Local resident Ronnie Mixon, who also spoke at the protest. Photo: Jim West. * Kevin Kamps, radioactive waste watchdog from Beyond Nuclear, gave some background on how harmful radioactivity is to human health. * Elena Herrada, a member of the Detroit School Board told the crowd that the school board passed a resolution that the DEQ deny the permit, in light of harm to Detroit school children. * Dawn DeRose, of the Committee to Ban Fracking in Michigan, gave an urgent pitch for volunteers to sign up to get signatures to get the Committee’s ban initiative on the 2016 ballot before the November deadline. The signature deadline is in November. The Committee reported in September collecting over 100,000 signatures toward the 252,523 requirement and intends to make it on the ballot. The ballot initiative would ban the processing and storage of frack wastes. This entry was posted in Uncategorized and tagged Ban Michigan Fracking, Beyond Nuclear, CommitteetoBanFrackinginMichigan, Detroit, Dynecol, frack, frack waste, fracking, Hamtramck, hydraulicfracturing, michigan, Michigan DEQ, naturalgas, radioactive, TENORM, US Ecology by BMF webmaster. Bookmark the permalink.